The invaders had been brutal. They turned the population into slaves. Those who weren’t slaves were taxed on anything of value. When there were objections, they chopped off the right foot of every man over 15. Worst of all, they trashed the fundamental religious beliefs ingrained in each person and forced the natives to worship what was to them a false god. The year was 1680. The invaders were the Spanish colonists and the natives were the Native Pueblo People of what is now New Mexico. The Spanish colonists were a cohesive, trained military force, mostly concentrated in the community of Santa Fe. The Native People were farmers, spread out and unorganized in their ancient Pueblos: Pecos, Acoma, Zuni, Taos and others. They were no match for mighty Spain. It was for that reason, on a moonlit evening in August, 1680, there was whispering in the night. Secret plans were being made. Something big was about to happen. The Native People planned it. The Spanish knew it was coming. They just didn’t know when. 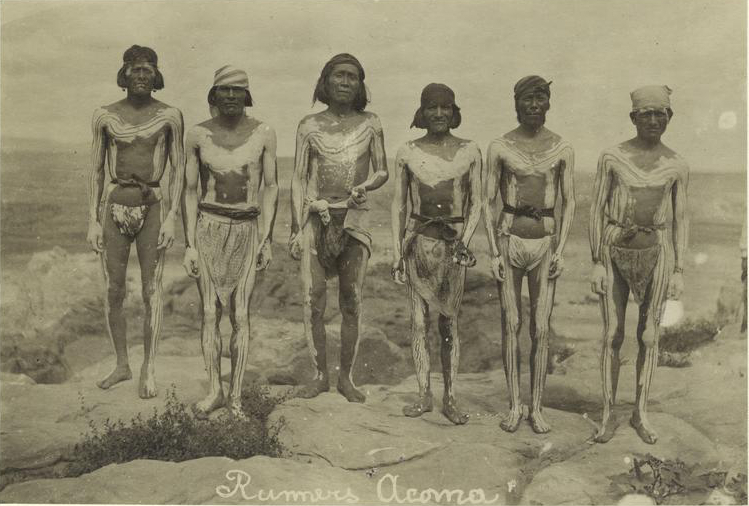 Acoma Pueblo runners carrying on the tradition. Men with the ability to run great distances were quietly chosen. In their hands were knotted ropes. They ran under cover of night to assigned Pueblos, with a plan to rid themselves of the Spanish intruders once and for all. The knots on the ropes indicated the day of the attack. Each knot untied in the morning indicated the passing of a another day. When the last knot was untied–the day had arrived. It was a simple plan of coordination–something the Native People had never done before on such a large scale. Five years earlier, the Spanish had arrested forty-seven medicine men from the Pueblos for practicing sorcery, bringing them to Santa Fe for punishment. Four of the medicine men were hung; another committed suicide and the rest were publically whipped before being eventually released. One of the released medicine men was a native of San Juan Pueblo. His name was Pope’. Taos, New Mexico, in an old photograph dated 1890. Nursing his wounds for five years from his base in Taos, Pope’ devised his revenge. He secretly visited each Pueblo to gain support. It was a difficult accomplishment, since each Pueblo spoke its own language and had its own separate culture. Somehow, Pope’ found a way. Because he was a respected medicine man, he was able to convince the Pueblo leaders that once the Spanish were expelled, ancient Pueblo gods would reward them with health and prosperity. Palace of the Governors, Santa Fe, New Mexico. It was built in 1610 and is the oldest continuously operated government building in the United States. The small settlement of Santa Fe received its supplies monthly by wagon train from Mexico. Just before the train arrived, supplies in the settlement, including military supplies, were at their lowest, making the Spanish vulnerable. The day of the attack was planned for August 11, before the next wagon train was scheduled to arrive. It was feared that traitors would warn the Spanish. For this reason, suspected traitors were secretly identified. Instead of capturing them, Pope’ used them creatively, giving them false information to report about the day of the attack, keeping for himself the element of surprise. But things went wrong. The Spanish were able to capture two Pueblo runners and tortured them until they revealed the secret of the knots. The Spanish would be prepared and waiting. Somehow, Pope’ learned about the runners’ capture and Spanish preparation. To keep his element of surprise, he changed the plan and began the attack a day earlier. 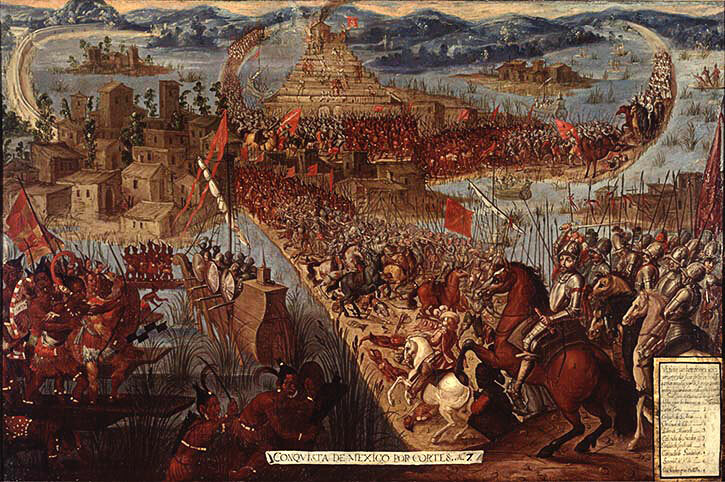 Pope’s scheme was this: fighters in each Pueblo would gather into as large a force as they could, and attack the few Spanish living nearby, and destroy them. After this, the fighters from each Pueblo would move toward Santa Fe and become part of a massive force. The Spanish population in the entire area was estimated to be 2,400, spread out thinly among the Pueblos and not a cohesive force. 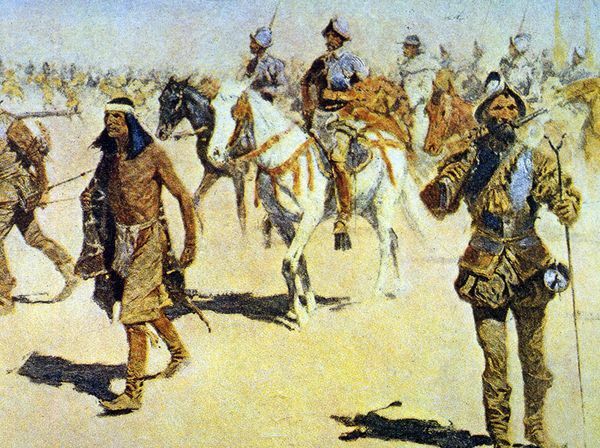 In Santa Fe, the center of Spanish operations, there were only about 170 Spanish men available to fight. The total Pueblo force had over 2,000 fighters. 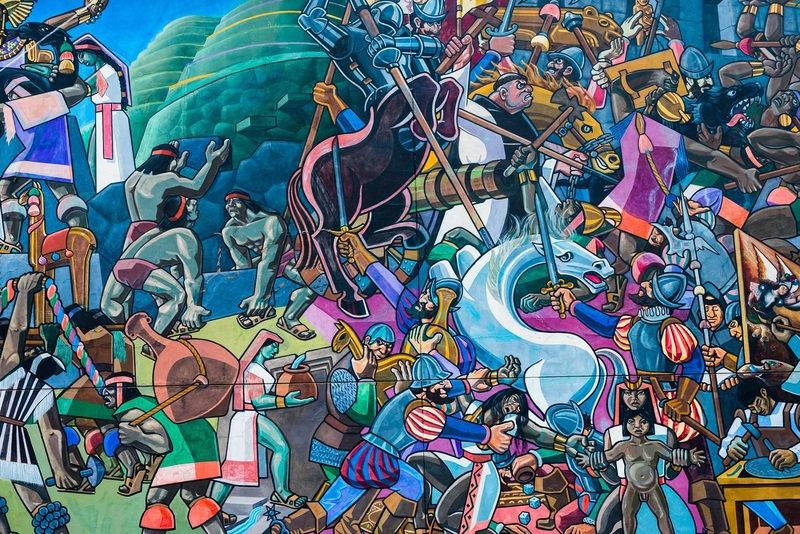 On August 10, 1680, the Pueblo fighters rose up against the Spanish. 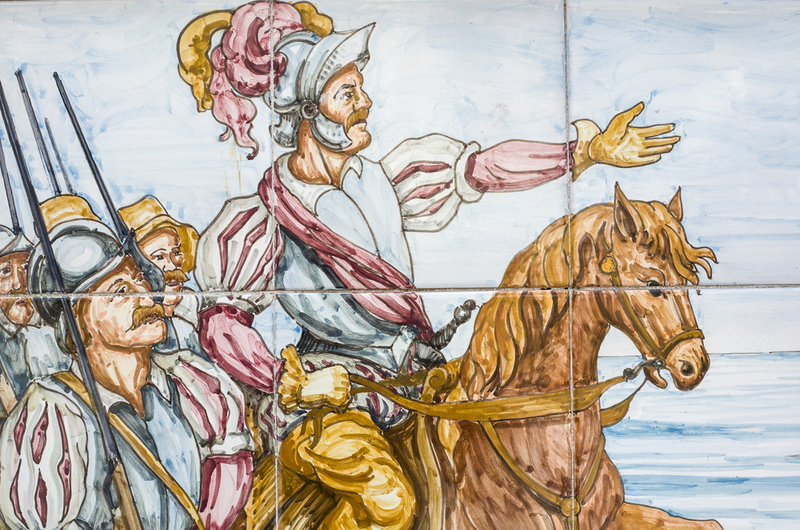 They began by stealing all their horses, to keep the Spanish from fleeing. They posted guards to seal off the escape roads leading to Santa Fe. Then they began pillaging the Spanish settlements, destroying everything Spanish, especially the churches. Four hundred Spanish men, women and children were killed, including 33 Franciscan missionaries. By August 13, 1680, it was all over. 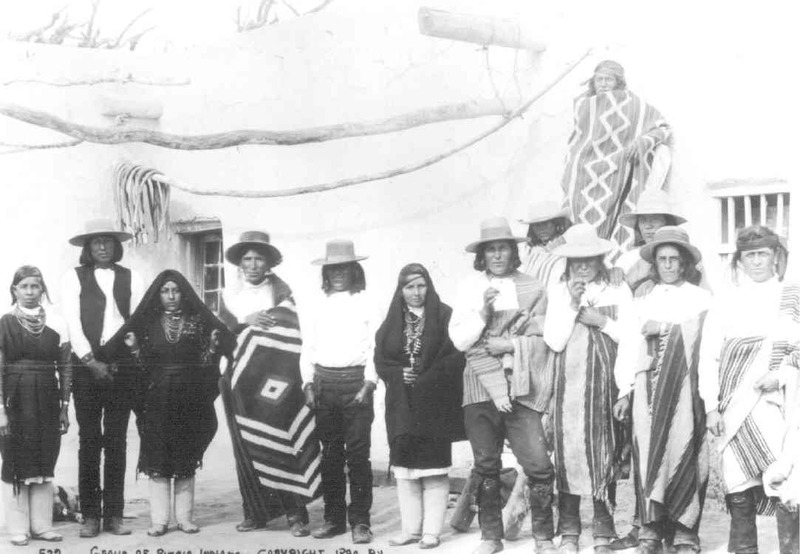 The Spanish had been driven out of the Pueblos and the remaining Spanish people were clustered in Santa Fe. 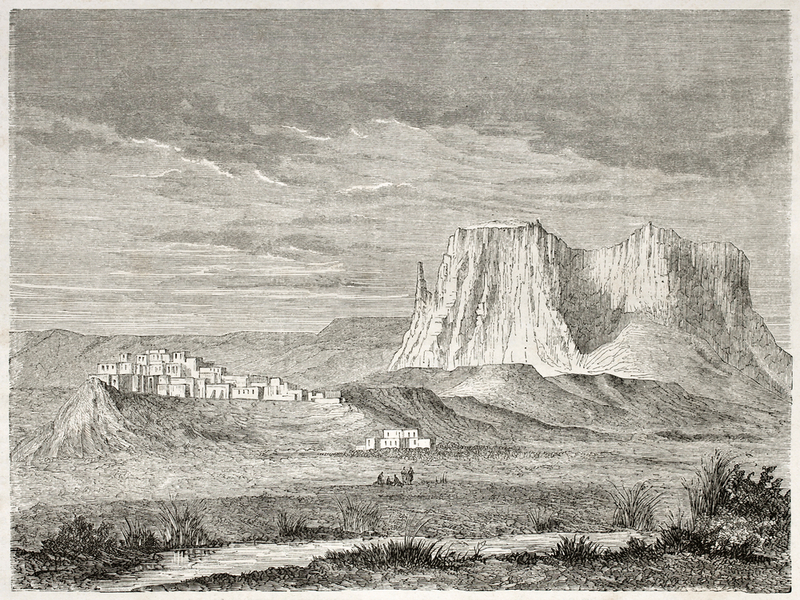 The Pueblo fighters surrounded the settlement and cut off its water supply. 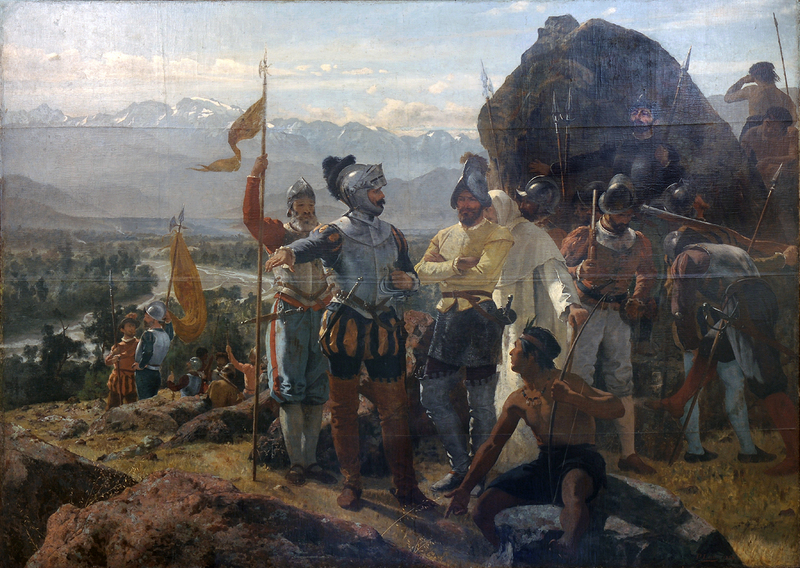 In a last ditch move, governor Antonio de Otermin gathered all the forces he could and started a last, desperate battle, causing the Pueblo fighters to retreat, costing many Native People’s lives. But de Otermin knew it would be foolish to press the attack. He took advantage of the opening to abandon Santa Fe. Eventually, around 2,000 survivors gathered at the town of Socorro and, by Spanish supply train, left New Mexico. The Pueblo People did not pursue them. 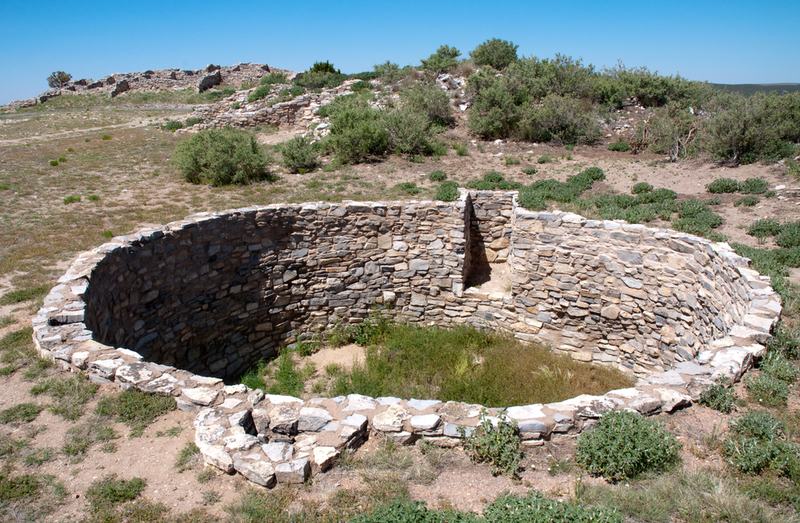 It is said that the Pueblo Revolt changed the entire Spanish rule of the Southwest. The Spanish learned that it was impossible for an invading nation to totally control this indigenous population. Twelve years later, the Spanish returned to the Pueblo area, but they were more respectful in their interactions with the Native People. The Pueblo peoples chose not to fight again and the two cultures coexisted reasonably peacefully for many years. 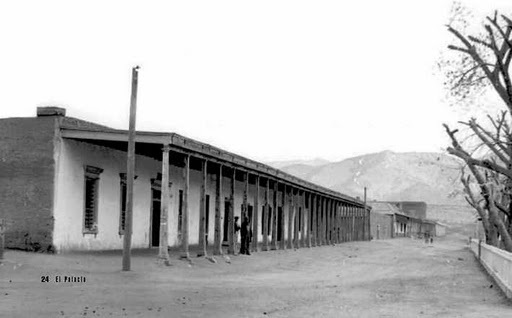 Two hundred years later, in 1886, those Pueblos, now in the United States of America, remained only lightly touched by the outside world – so untouched by time that knowledgeable tourists, who could afford to travel, visited the Pueblos as a fascinating remnant of the past. 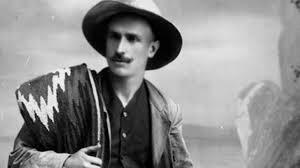 Charles Fletcher Lummis, author of “A Tramp Across the Continent”. 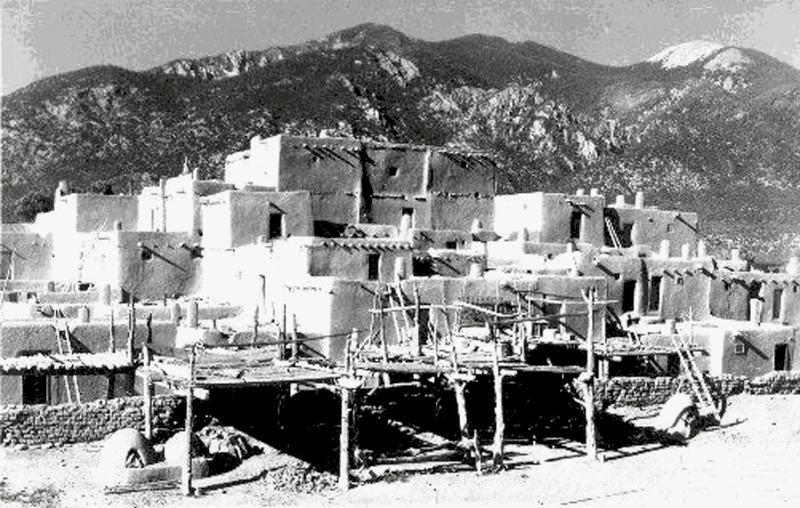 The Pueblos were also visited by an American Newspaperman named Charles Fletcher Lummis. When he first walked across the US from Cincinnati, Ohio, into the land of the Pueblos, Lummis was overwhelmed by what he saw and felt. In those days, there were no cars and, therefore, no paved streets, just the dusty trails of 1680. By then, the railroad had extended west, but the tracks were a long distance away from the Pueblos. There was no electricity, so there were no overhead wires. The life of Native Peoples continued its daily routine, as it had for hundreds of years. It was as if Charles Fletcher Lummis had been thrust back in a time warp. Friends of Charles Fletcher Lummis, during his recuperation. A few years later, when illness overtook Lummis and he had to resign from his post as City Editor of the Los Angeles Times, Lummis returned to the Southwest to heal. He stayed with his friends, the Chavez family, near the Pueblo of San Mateo. And with their kind attention, Lummis was nursed back to health.